I was quite hesitant to read Scarlet – I loved Cinder so much that I was afraid that Scarlet wouldn’t be able to live up to it. Now that I’m done with the book, I have a different reason for wanting not having read it. The book was so awesome that waiting for Cress is just too much! After the revelations of the ending in Cinder, the quest to find out more about Cinder’s past continues. 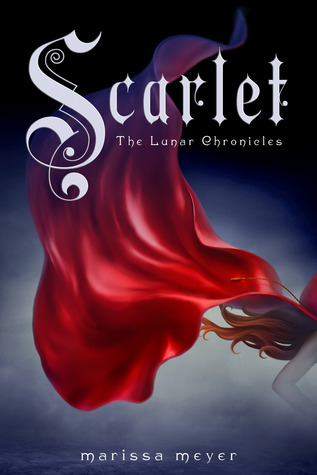 The story follows both Cinder and the title character Scarlet in their personal missions. Cinder is escaping prison where she also meets the very charming captain. Scarlet is following leads for her missing grandmother, since the police has deemed her disappearance a suicide. Sheesh, does Scarlet have a temper! She’s quite different from the more timid and even-natured Cinder. I think it really speaks for Meyer’s writing that she can make two such different characters believable. I enjoyed reading from Scarlet’s point of view, mainly because the main plot points of the book are in her parts. Cinder is still present in the book, but her story mainly takes the back seat. As the point of view switches between the characters throughout the book, I know some readers have complained about the story losing its velocity. I personally didn’t mind this, since I actually like stories that are told by different narrators, and Meyer did a wonderful job keeping the voices distinct. I loved the way the overall storyline keeps unfolding and is getting more depth. The tensions between earth and the moon reach a high point, and the Queen is coming ever closer to open war against the earthlings. It pains me to think I will have to wait two more years until I know how this story ends. Scarlet is a worthy sequel to Cinder, and one I would recommend to well, nearly anybody. These are books that I will continue to reread again and again.